First there was Girt. Now comes . . . 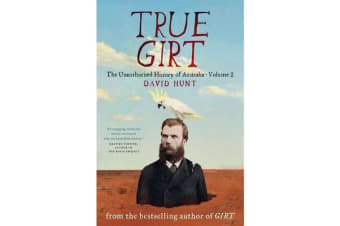 True GirtIn this side-splitting sequel to his best-selling history, David Hunt takes us to the Australian frontier. This was the Wild South, home to hardy pioneers, gun-slinging bushrangers, directionally challenged explorers, nervous indigenous people, Caroline Chisholm and sheep. Lots of sheep.True Girt introduces Thomas Davey, the hard-drinking Tasmanian governor who invented the Blow My Skull cocktail, and Captain Moonlite, Australia’s most famous LGBTI bushranger. Meet William Nicholson, the Melbourne hipster who gave Australia the steam-powered coffee roaster and the world the secret ballot. And say hello to Harry, the first camel used in Australian exploration, who shot dead his owner, the explorer John Horrocks.Learn how Truganini’s death inspired the Martian invasion of Earth. Discover the role of Hall and Oates in the Myall Creek Massacre. And be reminded why you should never ever smoke with the Wild Colonial Boy and Mad Dan Morgan.If Manning Clark and Bill Bryson were left on a desert island with only one pen, they would write True Girt.